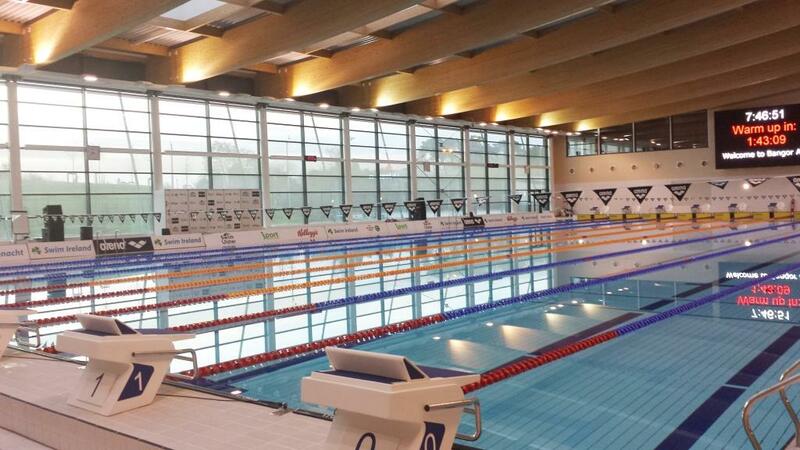 The Swim Ulster Age Group and Youth Championships in the fantastic Bangor Aurora Centre has been the venue of choice for Leinster Swimming’s first AGE Group travelling team to show their depth and racing strength over this weekend. Team TSC has been represented by Ellen Walshe (12yrs), Jessica Burke (13yrs), Evan Rossiter (13yrs) and Cathal Tan (15yrs). The athletes have done a fantastic job over the 3 days of racing against their Swim Ulster peers. On the first day of the meet Ellen Walshe (12 yrs) delivered two superb swims to finish in Silver medal position in the Girls 200BC and a big PB as this was a new event for her, whilst also picking up Bronze in the 100FC in another new PB. On the Saturday she produced some strong morning racing to qualify for both finals in the 200IM qualifying 4th & 200BF where she qualified 2nd. In the Finals that evening Ellen swam to a 4th place finish in the 200IM but was back on the blocks within a few minutes to deliver a strong new PB swim in the 200BF, and netting a further Silver medal for the weekend. On the final day of racing, Ellen again made further improvements to PB’s as she again smashed her PB in the 400IM, before returning tonight for a tough final in the 100BF, setting a new PB again and a further silver medal for her efforts. A fantastic learning experience and great opportunity to gain additional exposure, truly capitalised on by Ellen. Jessica Burke (13Yrs) headed in to the weekend having changed her racing events late in the program but was delighted with the overall weekend outcome. Heading in to the first session Jessica’s developing strength in the gym paid off as she delivered a strong new PB in the 100FC with a big result whilst also converting a strong 200BC result to qualify 4th fastest overall for Finals but fail to progress to the final based on a limited number of non-Ulster competitors being allowed to swim Finals. All in all Jessica posted 2 swims in the top 4 of her age group so going to be happy with that for the first day of the meet. On the second day of racing she again showed just how beneficial getting stronger is as she powered her way to a new 9 second LC PB in the 400FC and a Gold medal for her troubles. In a similar situation for the previous day, Jessica missed out on a final spot having finished as the 5th fastest qualifier in her age group but following a swimdown and rest on the Saturday returned today, the final day of the meet to post another huge heat swim PB in the 200FC, returning again this evening to further improve that time and finish in 2nd place overall in the event. Evan Rossiter (13yrs) in his first selection on a travelling team was also delighted to convert heat Swim PB’s on day 1 to ensure that in qualifying for the final in both of his events, he had the chance to further improve on the PB’s set in the heats. He took both opportunities to PB again, smashing a big PB in his Back crawl event to finish in 5th overall while also recording another PB int he 200FC as he finished in 9th place in the final. His confident performances on Day 2 were continued as he again powered to heat swim PB’s to qualify for the 100FC final in a strong new result which allowed him finish in 7th place in the final in the afternoon, whilst also racing he 100BF in the morning gaining additional LC racing en route. The final day of racing saw Evan post another huge PB in the 400FC, finishing in 7th place overall in his age group while his continued development in Backcrawl also saw a two further PB’s between heats and finals and a big 6th place finish to cap off a great weekend of racing. As the older athletes in the group Cathal Tan (15yrs) too, was on his first representative travelling team and delivered qualifying swims from the heats on Day 1 to return in the pm to take the bronze medal in the FC in a new PB time, whilst also delivering a strong final Swim in the Breaststroke Swim to finish in 7th place also in his age group. Day 2 of the meet again saw Cathal pick up some further strong heat swims as he qualified for the final in the 100FC equalling his PB but finishing in 4th place overall before finishing in a strong 5th place finish in the 200BS having improved his heat swim by some 2 seconds in the process. The final day of racing was another strong one for Cathal as he finished in the bronze medal position again int he 400FC before also completing his weekend with a 7th place result in the 100BC where he was outside the PB time he had set at the Leinster Championships last weekend. This weekend of racing was a great experience for the Team of 4 Travelling club athletes who participated as part of the broader Leinster team of 33 athletes for the event. The racing that was delivered over the 3 days will help the athletes as they continue to prepare for the bigger meets later in the season. Thanks to Leinster Swimming for giving the athletes the opportunity to be part of the team and to the Team Staff who helped the athletes get the most out of the weekend.